Thank you for this recipe. It took me four times to succeed. Even after baking my 4th cake, I didn’t realize I succeed because I didn’t pay attention on the cake pan size. Mine is 9.5” and yours in the photo is 6”. I kept thinking how come my cake only rose to 1.5” but Christine’s seems at least 3” tall. After some calculating in volume, I figured out that I had already succeeded in baking this cake. I doubled your recipe and baked the Chiffon cake in my 9” pan for 20 min. at 180°C and 30 min. at 160°C. It came out with the height of 3” just as yours in the photo. Everybody in my fellowship tried it and liked it. My pastor’s wife even asked for the recipe. Do worry,; I will give credit to you. Thank you. Happy Mother's Day ! Glad to hear the good news. Congrats. Once you got it right, you can make as many as you like. So good. im using fan mode build in oven...think may have to adjust the degree? should I add a bit tartar powder next time?? 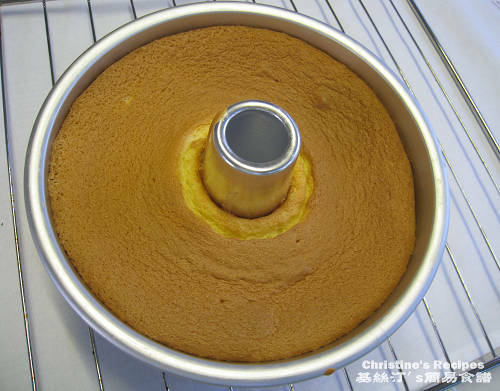 You can bake this chiffon cake with fan-forced mode too. If using fan-forced, just decrease the temperature by 20C. By adding a bit of cream of tartar, the beaten egg whites would be more stablized and the cake won't collapse easily. I tried baking the Pandan Chiffon cake today and it was a success! :) Thank you very much for the recipes! They are brilliant. I'm thinking to try the Orange Chiffon cake however I noted that there is no cream of tartar required in whisking the egg white as opposed to the Pandan Chiffon cake. Is there a reason for being so? 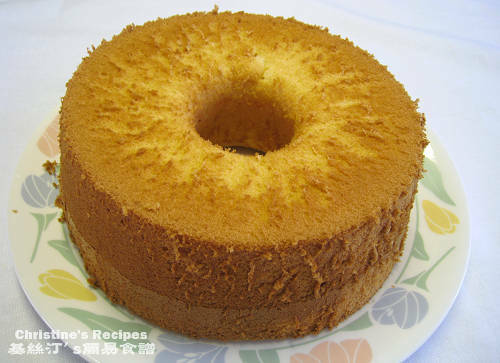 By the way, do you happen to have a recipe for sponge cake (not Victoria sponge cake though) which is commonly found in Asian cream cake, such as fruit cream cakes水果忌廉蛋糕? The cream of tartar can help stabilize the shape of the beaten egg whites, although it's not a must to add. Please add some, about 1/4 tsp if you're not confidence in beating egg whites. Love 水果忌廉蛋糕 too. Will share when I make one. Your description on how to whip the egg white is very helpful. Without that bit of information, I don't think my cake would have come out right. 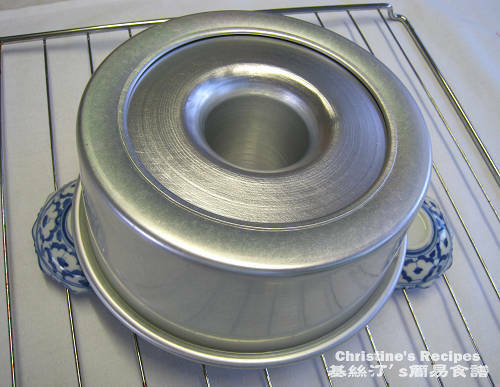 By the way Christine, how do you remove the cake from the bake pan so perfectly without the cake falling apart? It's a pleasure to visit your blog. Thanks for taking the time to share your cooking experience and recipes! Glad that you tried and loved my recipes. I just ran a sharp knife around the edges of the cake, then pressed lightly if necessary. The cake could be removed without much troubles. Also, my cake raise about 30% in the first 10 min while it is baking, but then it drop back to original after 10 min. Is it because of the 蛋糕焗模 or some other reason? If your cake raised about 30% in the first 10 minutes, highly probable that your oven temperature was too high. When removing the cake, I just run a sharp knife inside the cake mould. It's very easy. If you use silicon cake mould, it should be easier. Let it cool down a bit, then blend the sides of your mould, your cake could come out without any effort. Perhaps you might try greasing it with a bit oil next time. Why needn't to put cream of tartar this time? Oh yes, if the egg whites are beaten well enough and folded-in properly, it doesn't need to. Having said that, you may add ½ tsp of cream of tartar to stabilize the beaten egg whites.